I want to introduce Servals’ progress with the Plant Oil Lamp. The plant oil used is Straight Vegetable Oil only. I believe it will find great use in rural households which do not have electric power… a definite low cost, sustainable energy alternative. Besides it is a carbon neutral initiative. Oil level maintained constant for the wick. Glass cover for protection of flame against mild wind. Level of wick can be adjusted in the oil for brighter/dimmer light. Wick can be easily removed and put back for lighting and removal of carbon. For putting off the flame, wick can be fully immersed in the oil easily. No need to blow the flame out and no need to take out the wick. Lamp looks simple, small and cute. This lamp is of low lighting power and is meant only for general dim background lighting and not for purposes like reading, etc. Fill the oil bottle and invert it in the designated spot. Allow the oil level to become steady in the lamp. Insert the wick in the wick holder and wet it with plant oil by sliding the wick to the bottom most part in the lamp by lowering the wick holder. Ensure that the top of the wick is wet with oil. Take out the wick holder ( with wick ) slightly and light the top of the wick with any small flame. Put the wick holder back into the lamp to any desired position for the required light intensity. Adjust the position of the wick holder for the required light intensity. Please note that the flame always ideally stands just on top of the oil in any plant oil lamp - this is totally different from a kerosene lamp. 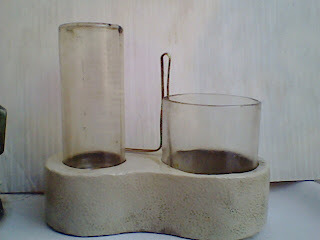 Never use kerosene or similar fuel in any plant oil lamp. It is extremely dangerous. For repeated uses, remove carbon from the tip of the wick before lighting up. 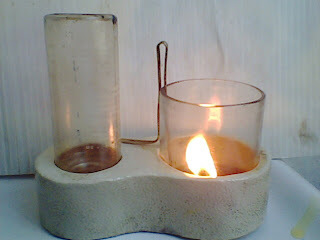 For putting off the lamp, just push down the wick holder such that the top of the wick goes below the oil level. This way, it is also ready for the next lighting cycle. Wipe the inside and outside of the glass cover occasionally to keep it clean and transparent. Also wipe the outside of the oil bottle clean for better visibility of the oil level inside the bottle. Been trying to use used cooking oil in a kerosene lamp. the wick burns faster w/ used cooking oil. the wick also needs to be adjusted every now & then.